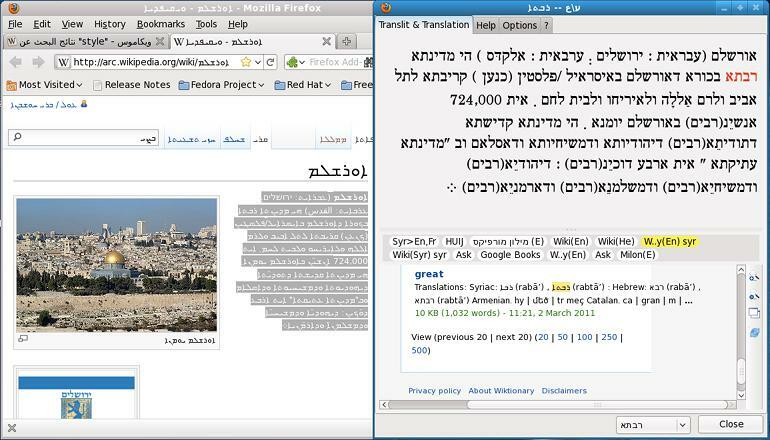 ע\ع (Ayn\Ayn) Lookup [former ע\ع (Ayn\Ayn) Converter] is a multi-purpose text research Mozilla XUL web-browser add-on with advanced support of Semitic languages. It looks simultaneously for a selected text in many online dictionaries, encyclopedias and in other online resources. Also it converts texts written in Arabic/Syriac/Phonenician/Imperial Aramaic scripts (with diacritics if any) to Hebrew writing system (and can feed Hebrew text, transliterated to Syriac writing system, to a Syriac dictionary to find Aramaic translations there) . 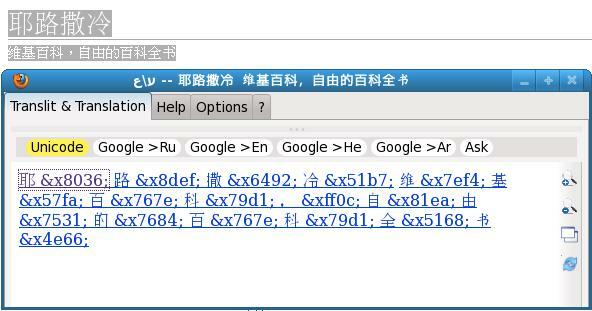 Also, it's possible to use this converter online in any browser to convert any text to Hebrew writing system. The add-on had been developed as a Mozilla XUL browser add-on, it is not compatible with new Firefox Quantum (the web-version is compatible with Quantum, of cause), but it works with SeaMonkey, Basilisk, Pale Moon, Waterfox and other browsers based on Mozilla XUL. Transliteration of Arabic/Syriac text, vocalized or not, to Hebrew writing system (read more). 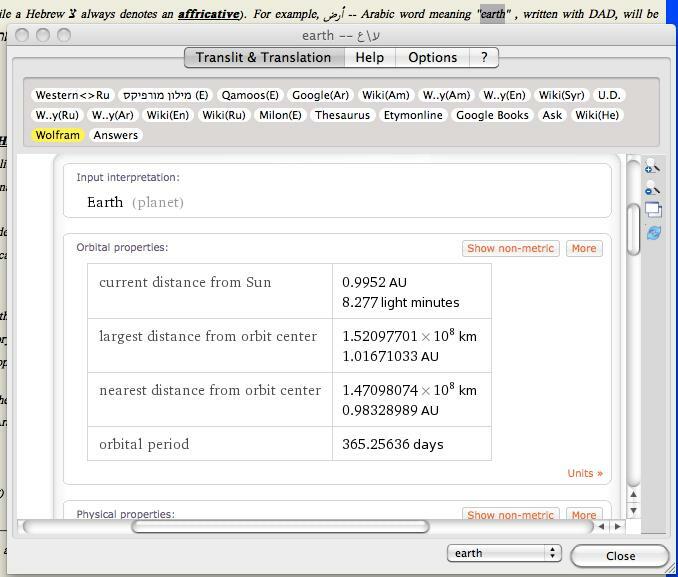 Translation of the text with various online dictionaries and translation services. Some stemming can be performed by the Add-On if a word is not found in a dictionary. There is support for Ar>En, He, Ru ; He>Ar, En, Ru ; West European Languages>Ru ; Syr>En, Fr ; Aram>He ; Persian>En ; Yiddish>En ; Ru>West European Languages , Ar, En dictionaries. Google Translate is used to translate text blocks or when a dictionary translation is not available. 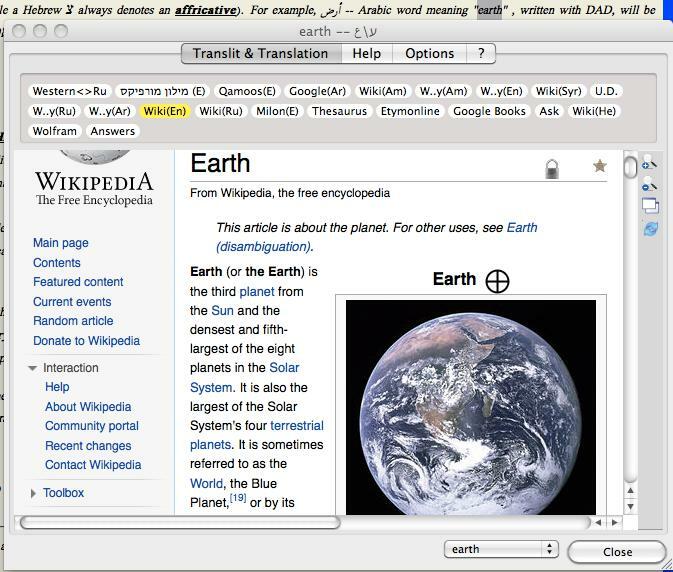 Also the Add-On utilizes Wikipedia's "see in another language" links to translate available terms. Articles from various encyclopedias and other related sources. 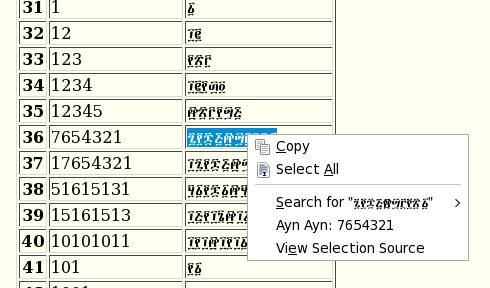 Unicode info on each character of the selected text. Current version of the extension is 1.15.2. The changelog. This program is distributed in the hope that it will be useful, but WITHOUT ANY WARRANTY; without even the implied warranty of MERCHANTABILITY or FITNESS FOR A PARTICULAR PURPOSE. The Author shall not be responsible for, and shall not pay, any amount of incidental, consequential or other indirect damages, whether based on lost revenue or otherwise, regardless of whether The Author was advised of the possibility of such losses in advance. Install the extension from the Mozilla site. In order to use this software, select a text block (a word or several words, or a word part) with a mouse in the browser window then use context menu to get the transliteration, the translation, and the other selection related info. Aramaic and Arabic languages are close relatives of Hebrew, and transliteration to Hebrew writing system makes many words recognizable for a Hebrew speaker. The transliteration model is made to make the Arabic words easy recognizable for a Hebrew reader (the pronunciation is given according to the literary Arabic pronunciation) . In the Hebrew, letters בגדכפת have (or had) two variants of pronunciation : plosive and fricative. Dagesh Qal is used to denote a plosive variant. Lesser known upperscore line -- Rafe, may be used to denote a fricative one. The converter uses both these signs. Also, it uses geresh sign to mark a letter with a different from the Hebrew pronunciation if both the letter pronunciation variants are plosive or fricative (the converter, where it is possible, does not use the modern Hebrew geresh based Arabic transliteration). While in the modern Israeli Hebrew only כ and פ still have each two pronunciations, in the Liturgical Mizrahi Hebrew all בכפת letters have two pronunciations (גד have each two pronunciations in the Yemeni Hebrew ), and this converter uses Liturgical Mizrahi/Yemeni Hebrew בגדכפת pronunciation to reflect specific Arabic sounds in the transliterated text. דֿֿ/ذ sound like "th" of the English word "this"
טֿ/ظ sound like "th" of the English word "thus"
תֿ/ﺙ sounds like "th" of the English word "thin"
The letter غ GHAYN denotes an ר-like sound, voiced uvular fricative. Many ashkenazi Jews pronounce ר by this way. 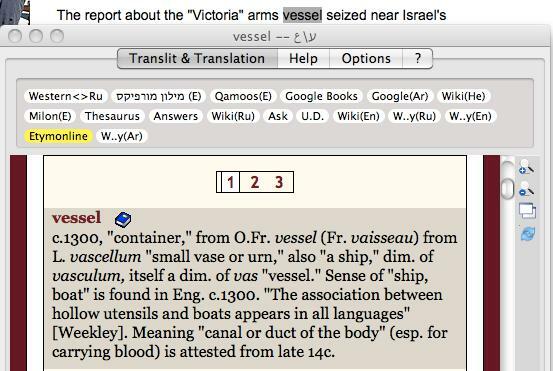 It were phonetically consistent to transliterate it as רֿ, but the converter maps it to עֿ, because غ is linked etymologically with ע and not with ר. In the converted Syriac text GHAYN ordinarily will be mapped to גֿ , for example, in the word בגֿדד ( a special dot "רוככא" is used in the original text to mark a "soft" letter ) . The letter ر\ר denotes itself, in Arabic, a trill sound close to the Amharic/Russian R. This sound is very difficult for most ashkenazi jews to pronounce, and local helpers of nazis in the Eastern Europe used a russian word "KUKURUZA"/"кукуруза" as a shibboleth to recognize jews for the extermination. The letter and the diacritic sign ء HAMZA denotes a glottal stop while alif w/o HAMZA denotes mostly a long /a:/ vowel. In the Hebrew, א denotes a mandatory glottal stop when the alef has a shva niqqud אְ, or when the letter just before the alef has a shva . The converter treats HAMZA as a mandatory stop, and puts alef with shva there, but omits the leading אְ. For example إِسْرَائِيل will be transliterated as אִסְרָאְיִיל . The shva in the converted Arabic text should never be pronounced, as sukun (سكون) it denotes absence of vowel. Kamatz denotes long /a:/ in the converted Arabic and Eastern Syriac texts, but /o/ in the converted Western Syriac. To read Syriac, and use the Syriac dictionary you need install East Syriac Adiabene and Serto Kharput fonts from the Beth Mardutho font collection. http://www.bethmardutho.org/ -- info on Syriac, Syriac fonts and keyboard. http://maskani.lugovsa.net/node/190 -- (Russian) учебник арамейского языка. http://www.ar-ru.ru/ -- (Russian) арабский алфавит, грамматика, словарь Баранова в электронной форме, книги, другая интересная и полезная информация. http://nuruliman.ru/ -- (Russian) аналогичный сайт, хозяин ведёт видеокурс арабского языка на youtube. Text Research Tools for Firefox. Copyright© 2009 by Zeev Belkin, All rights reserved.